The school district is not the best institution to prevent substance abuse, although it is sometimes held responsible by the community. It is parents who can absolutely make the most difference. 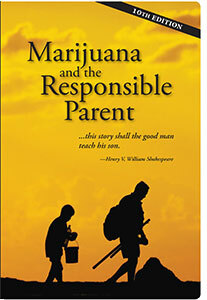 This booklet addresses how parents can prevent harm with regard to their children’s potential use of marijuana. The accepted reality now is that marijuana will be openly part of the world into which our children mature. There are risks that responsible education programming can address and diminish. Learn what school districts should do and should not do in drug abuse prevention programming. Includes D.A.R.E. evaluation. One of the most common question people ask is whether or not marijuana has lasting effects on intelligence. Our conclusion after reviewing a huge volume of recent research is that loss of intelligence is not a significant risk for occasional marijuana users. Most Americans today are living under significantly relaxed marijuana possession laws. It is important to ask how these evolving changes might affect young people. This pamphlet suggests ways that young people might be impacted and offers guidelines for results-based drug prevention programming.